According to the resolution of Special General Political Board in early 1924 Bolshevo labor commune was founded on the premises of "Kostino" state farm, which was set up in 1919 and engaged in experimental seed farming. The necessity to found the commune as well as many other similar organizations in our country, was caused by the rapid increase in number of waifs after the end of World War I (1914-1917), revolution of 1917 and Civil war (1918-1921). They stole, robbed and presented a serious social danger. That's why communes and children's homes were founded all over the country, where minors were reformed and educated. 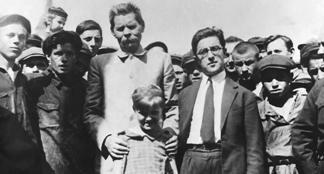 That time Bolshevo commune numbered 33 pupils and 8 members of the staff. The basic principle of its life was self-government. The task of the teachers was to train adolescents for any profession. For this purpose in October 1924 joiner's- and shoe workshops were set up, which between 1926 and 1933 expanded and mastered knitted goods-, shoe-, timber- and metal-processing production. 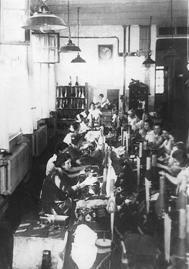 The commune produced sports shoes and clothes, skies, tennis rackets and skates. The production was profitable, the housing problems were successfully solved, Young Pioneer camp was built, in 1933 a training complex was set up, the passion for sport and art was encouraged. Finally the commune numbered over 4 thousand people. 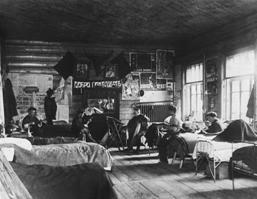 During 15-year experiment of the young offenders' re-education, Bolshevo labor commune gained vast pedagogical experience, which many soviet and foreign specialists came to adopt. It goes without saying that the commune development contributed to the fact that in 1939 Kostino settlement obtained status of a town. Nevertheless, on January 1, 1939 the commune was closed. Against many teachers and pupils were taken repressive actions. Under the resolution of the USSR People's Commissariat Council, the commune's productive area and premises were turned over to the RSFSR People's Commissariat of the Light Industry. Instead of it Bolshevo sports equipment integrated plant was set up, which continued producing sports clothes and shoes, skies, skates and other sports goods. In April 1940 the USSR People's Commissariat Council passed a resolution on setting-up a new plant on the premises of Bolshevo sports equipment integrated plant. Under decree #713/524 of December 10, 1939 of the People's Commissariats of the USSR Aircraft Industry and RSFSR Light Industry, a special commission was founded to include the integrated plant into a list of the USSR Aircraft Industry enterprises. Under decree #220 of March 9, 1941 of the People's Commissariat of the Aircraft Industry Bolshevo Sports Equipment Integrated Plant was reorganized into the State Union Plant / Unitary Plant #472. It submitted to the Second General Board of the People's Commissariat. The chief of the Board had to fulfill government task, setting up new enterprise on the existing productive areas to manufacture water- and oil-cooled aircraft radiators and equipment for the aircraft industry. The 22nd of June, 1941 World War II began. In August 1941 the USSR government founded an evacuation committee, which co-ordinated the evacuation of the strategically important enterprise inland. The plant #472 was evacuated to Kuznetsk, Penza region. 150 railway trucks were used to transport main part of the equipment and 200 railway carriages for the workers, specialists and their families. The evacuation was fully completed in October 1941. After the rout of fascists near Moscow early 1942 a branch of Kuibishev plant #145 was set up on the productive areas of the evacuated plant #472. It manufactured aircraft spray tanks of VAP-6M and VAP-500 types as well as equipment for the aircraft industry. Nikolai K. Sorokin was appointed director of the branch of the plant #145, Ivan G. Terekhov took the post of a head engineer. During 6 months of the branch operation, its management scheme was considered too cumbersome and risky, especially in wartime. The State Defense Committee made a decision to found an independent defense enterprise on the premises of the branch. On June 3, 1942 the State Defense Committee passed resolution on foundation of the Union factory 455. It is that date when the official history of Tactical Missiles Corporation began. Nikolai K. Sorokin was appointed director of the newly founded enterprise and Ivan G. Terekhov took the post of a head engineer. The number of workers amounted to 596 people. The laid up equipment was put into operation again, new machines were installed. In autumn of 1942 the enterprise manufactured its own products - cases of aircraft cast tanks VAP-200, VAP-400 and VAP-500. That time three production- and two auxiliary shops operated. In 1943 under decree #359 of April 27 of the deputy People's Commissar of the Aircraft Industry Michael P. Gorbunov was appointed director of the plant. By the end of the war, between 1944 and 1945, the People's Commissariat of the Aircraft Industry expanded the range of manufacturing products, producing mechanical emergency tripper devices for bombers. Under decree of May 19, 1944 of the People's Comissariat of the Aircraft Industry Alexander G. Alexandrov was appointed head engineer of the plant #455. After the end of World War II many workers and specialists, evacuated in 1941 to Kuznetsk, returned to Kostino and worked at the plant #455. In the first post-war years the enterprise made a depressive effect. Its productive, storage and housing facilities were half-ruined. Horse teams served as the basic means of transport. 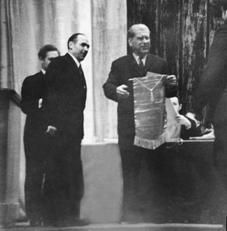 In 1946 Ministry of the Aircraft Industry put new products in the plant's production program. They were cluster engines KD4-456A and KD3-246A locks B-4 and B-10-U as well as electric drivers for bombers, developed at A. N. Tupolev design bureau. In 1946 Vasilii I. Kuzmin was appointed head engineer. The key task of the post-war years was to restore and expand the plant #455. Within the frameworks of this project in 1946 test shop, casthouse with casting-, forging and heat-treating departments as well as factory laboratory department were founded. Between 1947 and 1949 a machine- and electroplated coating shops were reconstructed. In 1950s the plant #455 rapidly developed. The productive areas were expanded, new departments were founded, and social problems were gradually solved. Michael P. Arzhakov, who was appointed director of the plant #455 on May 13, 1950, made a valuable contribution to the successful development of the enterprise. In 1950 the block #16, where shop #4 was situated, as well as chief technologist-, chief metallurgist- and tool departments were restored under his leadership. Besides, an x-ray laboratory of the chief metallurgists department was founded and an assembly department of the shop #15 was reconstructed. At the close of 1950 on the initiative of Mikchael P. Arzhakov the range of consumer goods was expanded to set up their serial production. Up to that moment the enterprise produced metal dishes and other metal goods in small consumptions. 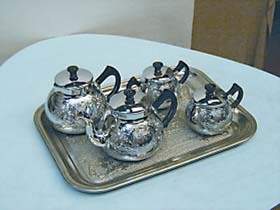 In 1953 a tea-and-coffee set, which later awarded the State Quality Mark, was developed and serially produced. In December 1951 under decree of the Minister of the Aircraft Industry Michael I. Muromtsev was appointed chief engineer of the plant. Between 1953 and 1955 the expansion of the plant as well as its social infrastructure was going on. 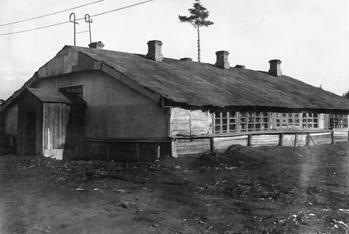 Final assembly shop and inspection station were founded, "Forest Lake" Young Pioneer camp was built. Having fulfilled the order on manufacturing turret units with automatic guidance, the enterprise became one of the leading weaponry suppliers for the air force. In 1955 Plant #455, later merged into Zvezda-Strela, one of the leading weaponry suppliers for the air force, received the government order on development of “air-to-air” missile systems. Specialists of the enterprise began development of the missiles. In 1956 the enterprise mastered serial production of the first Soviet guided “air-to-air” missile RS-1-U. It was developed by a famous designer, Dmitry L. Tomashevich, in an Experimental & Design Bureau-2 and intended to equip fighters MiG-17PFU and Yak-25P. The works on guided missiles’ development were expanded and on May 17, 1957 under decree of the Ministry of the Aircraft Industry a design bureau was founded on the premises of a serial design department at the plant #455. It was headed by Michael E. Edidovich, who had worked as a chief technologist of the enterprise before. The staff of the design bureau began developing “air-to-air” missile R-55 to equip Su-9, Su-15 fighters as well as one of MiG-21 modifications. Reconstruction and expansion of production capacities were going on. New technologies were mastered. In 1956 a technology of parts' forging and punch out of non-ferrous metal was mastered. Between 1958 and 1959 an automatic argon-arc welding of aluminum alloys was put in. Operating-and-repair departments and magnesium casting sector were founded. In the summer of 1958 management of the enterprise and experimental and design bureau, headed by Michael Arzhakov went to Akhtubinsk, Astrakhan region to choose the place for building their own test center. There was a need to draw qualified specialist to manufacture new types of products. As a result the graduants of Dnepropetrovsk State University and aircraft universities were employed. In 1959 the branch of the All-Union Correspondence Polytechnic Institute was founded on the premises of the enterprise. 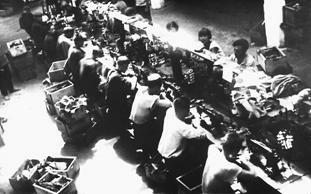 Beside the military products, consumer goods' production was actively developed at the enterprise. In 1958 a separate shop for serial production of tea-and-coffee sets was put into operation. In 1960s plant #455 went on expanding basic and auxiliary productions as well as products range. That time, beside serially produced missiles RS-1-U, RS-2-U and RS-2-US, the assembly of antiaircraft guided missile with an integrated power plant 3M9 for an antiaircraft missile system "Kub" was mastered. Chief designer I.I.Toropov in experimental & design bureau of the plant #134 headed the development of the antiaircraft missile system. Besides, the enterprise manufactured R-8M, R-8M1R, R-8M1T, K-98, K-98MP, K-98MT, R-4, R-40 "air-to-air" missiles, developed in Experimental & Design Bureau - 4, which was headed by a legendary designer of Soviet guided missiles, Matus R. Bisnovat. At the same time the plant manufactured compact target missiles Its-59 (Olen), Its-60 (Zayats), designed for training to apply "air-to-air" missile. They were controlled through computer and launched from fighters. For instance, ITs-59 (Olen) target-missile was equipped with autopilot and radio control-, trajectory and flight measurement-, data search and transmission equipment, transmitting the information to the ground measurement stations. It was launched from TU-16NKRM plane, after which the missile flew at the altitude of 15 meters. It was guided from the ground control station. According to the results of the state flying tests, the missile was put into service in 1964. A new “air-to-air” missile R-55, derived from RS-2-US and designed to equip MiG-21, Su-9 and Su-15 fighters was developed and serially produced. It was outfitted with an IR homer, which had enhanced jamming immunity that provided efficient missile operation at the altitude of up to 22 km and air target interception at the distance from 1,2 km and up to 10 km. In 1963 the first tests on RS-2-US missile application onto the ground targets were carried out. According to the statement #50 “The RS-2-US missile launches onto the ground targets are possible but pointless because of insufficient precision of missile’s hit with its small warhead”. Besides, in 1965 the Soviet government received an inquiry from Vietnam on “air-to-surface” missile development and supply. Engineering designs on its development were drawn up together with Mikoyan Experimental & Design Bureau and the State Scientific Research Institute of Aircraft Systems. Being approved by a collegium of Ministry of the Aircraft Industry they were passed to the plant #455. On April 30, 1966 the plant #455 was renamed to Kaliningrad Engineering Plant. In 1967 the enterprise started building an experimental complex in Ahtubinsk. In September 1968 Nikolai I. Zhuchkov was appointed chief engineer.